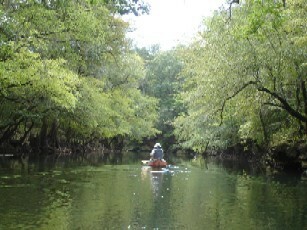 Marianna, FL--It was difficult to assemble a group willing to paddle the Chipola on a Thursday, Friday, and Saturday in September. John Williams had taken Art and Janice Shelfer to Utah for a raft trip. Several travelers contended that work schedules precluded mak ing the trip. Sam Brown promised to make the trip but claimed he was spider bitten and the doctor would not let him be in the sun. The preceding weeks had convinced some that global warming might actually be a fact. In the end, three veteran travelers (and military veterans) met for the thirty-eight mile paddle down the Chipola. George Royal and Donald May paddled the red Tripper and Charlie Stines soloed the Penobscot 16. The three met at the take-out spot at the SR 20 bridge just east of Blountstown, left George’s Highlander there, and rode the Exhibition to the put-in at SR 166 just outside Marianna. Loading the boats was fairly simple and the loads were moderately light. The trip was underway by about 10:30 Eastern time. The first section of the river was very pretty despite the large amount of litter. The Chipola is hardly more than a creek in the Marianna area, and it is a winding and obstructed one. The weather was cooler than many of the previous days but still probably reached the low nineties. The water was a pretty green color and was very clear. It was also very shallow and remained that way for most of the three-day trip. The early part of the trip saw a river bed of sand, but other sections would be limestone or gravel. 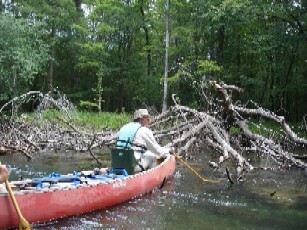 There was an abundance of downed trees, submerged logs, and brush to negotiate, but it was not difficult paddling. Neither was it fast. The Chipola was alive with bird life. Several ducks flew up as the paddlers rounded the first bend. Later little blue herons, great blue herons, egrets, ibises, owls, hawks, vultures, woodpeckers, and songbirds would entertain the group. There were also squirrels, raccoons, and deer along the way. It was a short paddle to the US 90 bridge. There is no river access at the point. The river continued its winding course underneath the railroad bridge. 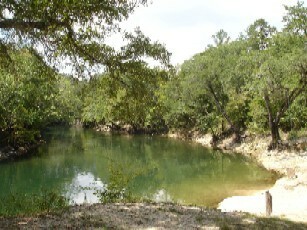 Just past the bridge on the right bank past some huge limestone boulders in the river was Alamo Cave. Although no one explored the cave it appeared large enough to allow the curious a little adventure. S hortly beyond the cave the run from Dykes Spring entered the river. 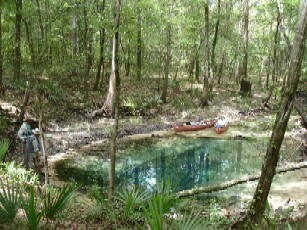 The travelers paddled the short distance to the spring and were really pleased that they did. The spring is small, but it appears to be deep and to have a good flow. The water was a deep blue. The spring was full of fish, and the fish seemed to enjoy the little treats Donald, Charlie, and George fed them. It was also the lunch stop for the gang. The next landmark was Spring Creek, the spring run from Blue Spring and Merritt’s Mill Pond. The water brought a tremendous amount of vegetation into the river. Shortly below Spring Creek the canoes crossed underneath Interstate 10. Some shoals were encountered but they only provided a little entertainment and posed no real threat. After traveling ten miles the group reached Magnolia Bridge at SR 280A. It was a good rest stop, and there was a man, J.D. Brown, there wanting to know about the river and about canoeing several streams in the area. J.D. is the investigator for the State Attorney’s office in Chipley so he and Charlie could talk shop as well as canoeing. The three men kept paddling and began looking for campsites. Before finding one the men got to see a small fawn come down to the river for a drink of water. 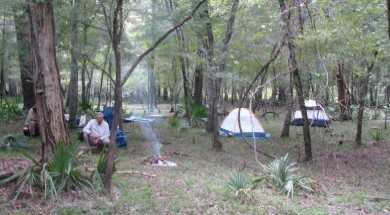 Finding campsites on the Chipola is no picnic. Sandbars are not there. The banks alternate between high clay banks and limestone banks. Much of the land is posted, and there is quite a bit of development along the river. Finally a halfway suitable spot was located on the left bank. It was in a cow pasture and although no cattle appeared they had definitely left evidence of their presence. Gnats and ants were abundant, but the ants were mostly not fire ants. However, the site was shaded and rather pretty. Once the tents were pitched George built a fire to bake potatoes and Charlie lit charcoal for the steaks. Donald actually grilled the steaks. They were excellent steaks and Donald cooked them just right. Charlie brought prepared salads from the gourmet restaurant known as Wendy’s. Af ter supper the men saw two deer almost in the campsite. The campers went to bed early. The sound of owls mingled with the mooing from the nearby cattle. Locusts sang their lullabies. Breakfast was standard Fellow Traveler fare--eggs, sausage (from Jones Country Meats), grits, bread, and coffee. When the dishes were washed the canoes were loaded and the men were paddling by nine o’clock. It was about six miles to the SR 278 bridge. The river still had a few obstructions and there were still some minor rapids. However, the SR 278 Peacock Bridge was spotted in less than a couple of hours. After a short rest stop the men continued downstream. The next section of the river contained lots of the small rapids. There were sharp limestone rocks and the canoes got hung on a couple of them, but the water was shallow and the little rapids were really lots of fun. The group finally heard human voices and found Johnny Boy’s boat landing on the left bank. Two young ladies there were getting ready to tube the river down to the Look and Tremble rapids. The women gave considerable information about the river and advised the group that they should camp at Lamb Eddie’s landing. From Johnny Boy’s it took less than an hour to reach the SR 274 bridge. There is no access at the bridge so the group did not stop there. A few minutes later they approached the famed Look and Tremble. After looking and trembling the three old men decided that discretion was the better part of valor and elected to portage. Once passing Look and Tremble the little rapids became a thing of the past. 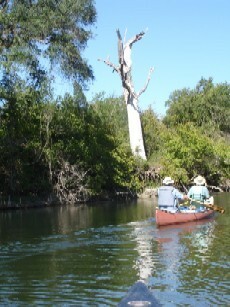 There was a lot of development along the river but the birds and wildlife still helped make an interesting paddle. There were a few suitable campsites including one on an island but the men made it to Lamb Eddie’s. Lamb Eddie’s is a Calhoun County boat landing and is an excellent campsite. There was a long carry up the boat ramp but it was a shady grassy area. A rumor reached the campers that camping was not prohibited by county ordinance throughout the entire county but a game warden passed by and only gave a friendly greeting. Sup per was Oscar Meyer tube steaks on buns with chili, mustard, and onions. There were fried potatoes as well. After supper and after river baths the campers were met by Eric Hamilton, a local resident who gave lots of information and lots of opinions. Once Eric left the three stayed awake quite a while enjoying the darkness provided by a quarter moon on a clear night. Finally it came time to call it quits and go to bed. Saturday breakfast was pancakes, syrup, bacon, and coffee. After eating the food the paddlers loaded the canoes and headed for the take-out. The river had become quite wide by that point but was still shallow. There were no more rapids. There were several possible between Lamb Eddie’s and the take-out. Once the destination was reached George and Donald took the Highlander back to Marianna to get the Exhibition and the trailer. George went home from there. Charlie waited with the canoes. Once Donald came back he and Charlie headed home but did stop for lunch at the Golden Skillet near Grand Ridge.